Our team has extensive experience providing program development, evaluation and fundraising expertise to help our nonprofit clients reach the next level. 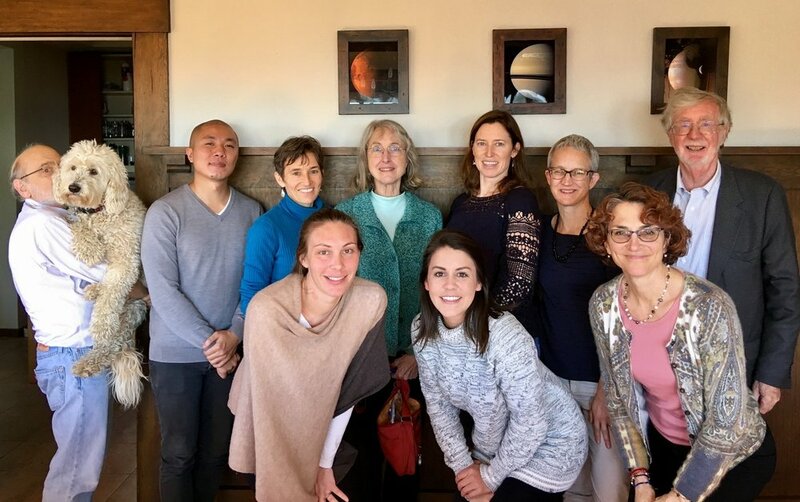 Anne (pictured bottom right) facilitated a retreat for the OASIS team in December 2017. Schonfield Consulting helped the OASIS Initiative (University of California initiative working in the Sahel) to develop and implement a fundraising plan. We identified “best fit” foundations, advised on foundation outreach, and developed a major donor cultivation strategy, resulting in a $750,000 gift from an individual donor. For the Community Alliance with Family Farmers, we planned, organized and co-wrote two successful multi-million dollar funding proposals to the California Water Resources Board, supporting ecological tree-crop farming ($900,000) and sustainable cotton production ($792,000). Faith (pictured center) working with Pazapa in Haiti to launch the Solidarity Shop -- giving Rose (left), Mireille (right) and other Haitians with disabilities the opportunity to earn a living. Schonfield Consulting supported the California Institute for Behavioral Health Solutions to identify and secure new funders for a rural mental health initiative in Tuolumne County, California. We researched “best fit” foundations, prepared a concept note for a leading foundation and helped plan a field visit for foundation staff. We assisted the Trans-African Hydro Meteorological Observatory with fundraising and business planning, including development of a $2+ million proposal to USAID for a network of real-time weather monitoring stations in East Africa. USAID selected this proposal as a finalist in the "Securing Water for Food" initiative. Schonfield Consulting's Faith Lemon supports the efforts of Pazapa to empower families marginalized by disability and poverty in Southeastern Haiti. In addition to grantwriting and outreach, Faith's responsibilities include developing partnerships for job access and advocacy, reducing expenses through new sourcing channels, refining program strategy, expanding infrastructure, managing communications and improving sustainability through diversification. Strategic planning retreat for Well Being Trust's core staff. In 2015, we helped the Natural Resources Defense Council develop a 5-year Strategic Plan for NRDC’s India Initiative, including goals, strategies and next steps in programs, operations, international partners and organizational support. Schonfield Consulting led NRDC staff, leadership, Board and India partners through a strategic development process with “visioning” sessions, interviews and planning workshops. "Thanks so much for your incredible support with our fundraising efforts. The OASIS team greatly respects your experience. In addition to great success with our major donors, we've also learned a lot from working with you." "I've worked very happily with Anne on numerous proposals and reports. She is a skilled thought partner and strong writer, and jumps into projects with little hand-holding. I would recommend Anne to anyone looking for a thoughtful, efficient and very capable consultant."